Take a few zinc granules in a conical flask. 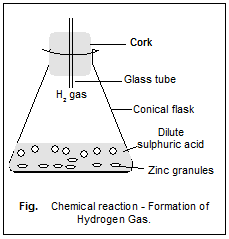 Add dilute hydrochloric acid (HCl) or sulphuric acid (H2SO4) in the conical flask. (a) What do you observe ? (b) Touch the conical flask and observe any change in its temperature ? Objective – A chemical reaction characterized by evolution of a gas and by evolving heat (exothermic reaction). (a) When zinc granules react with dilute H2SO4 or HCl (acid), a gas (H2) is evolved briskly. It can be confirmed by bringing a lighted candle near the mouth of the flask, the gas evolved starts burning with a popping sound. (b) This reaction liberates heat which can be observed when we touch the flask surface from outside, it feels hot. (i) Reactions which produce heat are called exothermic reactions. (ii) Evolution of a gas and liberation of heat characterize a chemical reaction.